Simon Poidevin believes Michael Hooper is a modern day Michael Jones. MICHAEL Hooper's injury has seen David Pocock return to the Wallabies captaincy and his preferred position at openside flanker. It's something that Hooper's critics have long called for - believing the 26-year-old veteran of 85 Tests doesn't offer enough at the breakdown. But former Wallabies captain Simon Poidevin believes Hooper has nothing to fear despite being ruled out of Saturday's Test against Argentina on the Gold Coast. "I think Hooper's done a great job as captain," Poidevin told foxsports.com.au. "There's no reason why - once he gets right - he won't come straight back into that position and given the style of game that the side is playing under a Michael Cheika regimen, Michael Hooper's the more natural No 7 than David Pocock." It will be the first Test that Hooper has missed since November, 2016 and just his fifth since debuting against Scotland in 2012. But while Hooper has been a mainstay for the Wallabies, his position in the side has long been debated. Last month, former Wallabies coach Alan Jones called for the fleet footed flanker to be shifted to the midfield. Poidevin - a former flanker and World Cup winner in 1991 - disagreed and compared the Wallabies captain to one of the all-time great No 7s, New Zealand's Michael Jones. "Hooper's very much a Michael Jones style of player," Poidevin said. "Speed's a great weapon and a great advantage in sport. 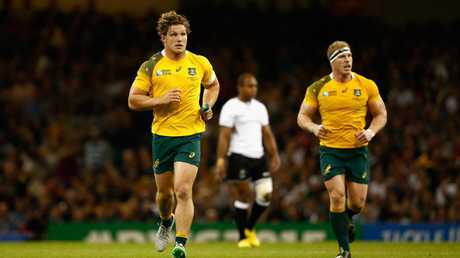 "One thing that Michael Hooper's got is extraordinary speed. "Michael Jones had extraordinary speed, so they're very similar in that respect. "You didn't see Michael Jones in the breakdown nearly as much as Richie McCaw or Sam Cane. "But Sam Cane wasn't a Michael Jones, Richie McCaw wasn't a Michael Jones. "Michael Jones was Michael Jones, and Hooper's a player in the last 20 years who mimics Michael Jones." 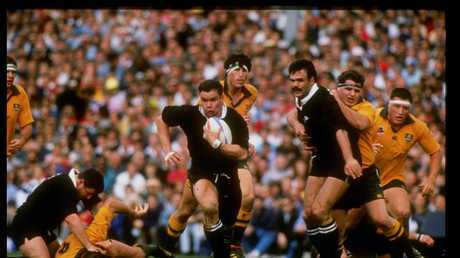 Michael Jones runs with the ball during the Bledisloe Cup 6-3 win over the Wallabies in 1991. Poidevin is well placed to comment on their similarities. The former Wallabies skipper squared up against Jones on four occasions in the back-row. "The thing is with him (Jones), seven of the eight in the All Black pack were just machines, so there was plenty of damage being done at the breakdown which Michael didn't have to do," Poidevin said. "So he had much more of a floating role within that team and ran his support lines really well, as Michael Hooper does." Poidevin also acknowledged that Pocock was continuing to elevate and broaden his own game. "Give credit to Poey, he knew he had to pick that part of his game up and he's done a great job since he's got back (from his sabbatical) to get much more involved in attack." 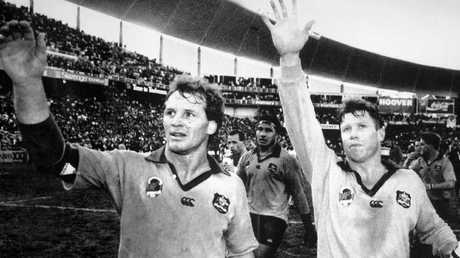 Wallabies Simon Poidevin and Nick Farr-Jones wave to the crowd after their 21-12 victory win over the All Blacks in Sydney in 1991. While Poidevin believed Hooper's absence would be felt against "a very athletic Argentinian back-row", he added that his injury would provide Cheika an opportunity to work out his preferred combination. 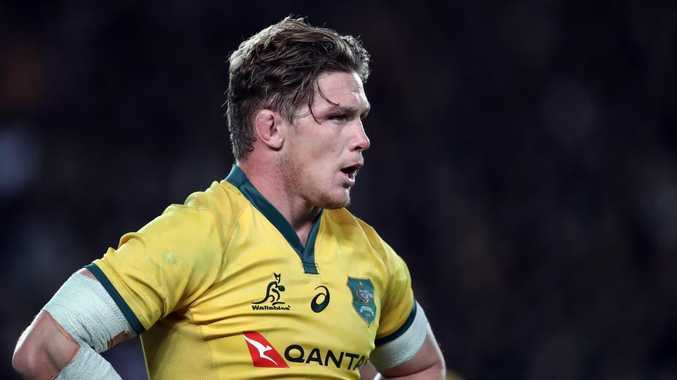 "I suppose the first thing is that it's a rare event that Michael Hooper's not playing for the Wallabies," Poidevin said. "He's a George Gregan of this era in that he so rarely gets injured. "But perhaps that's a good thing - a year out from the World Cup - that you've got the ability to get Pocock back in the 7 position, which clearly is his natural position. "He's been turned into a No 8, but this gives him a chance now to spend time playing 7, and 7's a pretty specialist role. "From my own perspective, we always played left and right, but in 1991 started playing openside and blindside and I had to mark Michael Jones so it was a pretty interesting exercise playing 7. 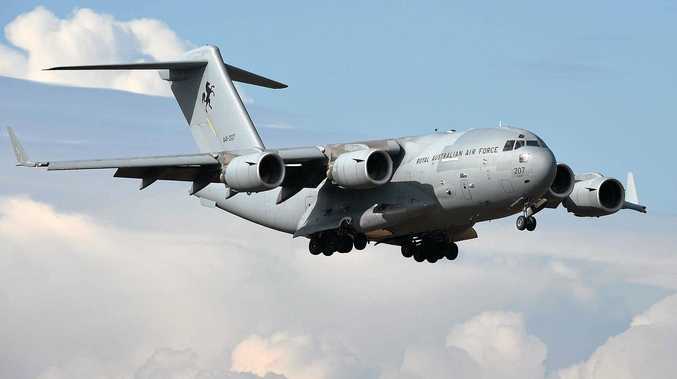 "Playing 7 is a very aerobic position. "Pocock's all over it and he has been developing the running game that Hooper's so good at, and obviously Hooper's been working on his work at the breakdown as well, so there's been a good complimentary mix there. "(Pete) Samu, Michael Cheika is a very astute picker of talent. "He saw Samu as someone who he wanted to bring in ahead of the World Cup, so a big opportunity for Pete. "He's got a big engine, he's fast, he doesn't bend the line as well as Lukhan Tui and that's his body shape. "I think there's been unfair criticism of Lukhan Tui being a second-rower playing as a No 6. "I think he's been one of our best players through the past five Test matches. "Against that All Blacks side in Auckland he was still going hammer and tongs until the 80th minute and I think that's a very big marker." Michael Hooper (l) and David Pocock have played together in the back-row since 2015. Poidevin added that he believed the Wallabies should continue with their "Pooper" combination of playing Pocock and Hooper in the back-row and wasn't of the belief that it negatively affected their lineout. "I think it's worked well," he said. "Our lineout problems in Sydney and to a lesser extent in Auckland (against the All Blacks) weren't about having two small backrowers. "Hooper is an option in the lineout, but we just weren't smart enough in the way we were moving that lineout round. "We started to get much smarter post Sydney, Auckland started to work well and Brisbane worked well against an enormous lineout. "It's just having the nous, making the right calls and moving the lineout around is extraordinarily important in this area."